for the differential equation, which tells us how the density goes down as we go up in energy. Here the constant of integration, n0, is obviously the density at h=0 (which can be chosen anywhere), and the density goes down exponentially with height. Fig. 40–2.The normalized density as a function of height in the earth’s gravitational field for oxygen and for hydrogen, at constant temperature. Note that if we have different kinds of molecules with different masses, they go down with different exponentials. The ones which were heavier would decrease with altitude faster than the light ones. Therefore we would expect that because oxygen is heavier than nitrogen, as we go higher and higher in an atmosphere with nitrogen and oxygen the proportion of nitrogen would increase. This does not really happen in our own atmosphere, at least at reasonable heights, because there is so much agitation which mixes the gases back together again. It is not an isothermal atmosphere. Nevertheless, there is a tendency for lighter materials, like hydrogen, to dominate at very great heights in the atmosphere, because the lowest masses continue to exist, while the other exponentials have all died out (Fig. 40–2). e−the potential energy of each atom/kT. That may be an accident, i.e., may be true only for this particular case of a uniform gravitational field. However, we can show that it is a more general proposition. Suppose that there were some kind of force other than gravity acting on the molecules in a gas. For example, the molecules may be charged electrically, and may be acted on by an electric field or another charge that attracts them. Or, because of the mutual attractions of the atoms for each other, or for the wall, or for a solid, or something, there is some force of attraction which varies with position and which acts on all the molecules. Now suppose, for simplicity, that the molecules are all the same, and that the force acts on each individual one, so that the total force on a piece of gas would be simply the number of molecules times the force on each one. To avoid unnecessary complication, let us choose a coordinate system with the x-axis in the direction of the force, F.
Therefore what we noticed in a special case turns out to be true in general. (What if F does not come from a potential? Then (40.2) has no solution at all. Energy can be generated, or lost by the atoms running around in cyclic paths for which the work done is not zero, and no equilibrium can be maintained at all. Thermal equilibrium cannot exist if the external forces on the atoms are not conservative.) Equation (40.3), known as Boltzmann’s law, is another of the principles of statistical mechanics: that the probability of finding molecules in a given spatial arrangement varies exponentially with the negative of the potential energy of that arrangement, divided by kT. So we find that the probabilities of different conditions of energy, kinetic and potential, are both given by e−energy/kT, a very easy thing to remember and a rather beautiful proposition. You can see that this formula must be right because, first, it is a function only of v2, as required, and second, the probabilities of various values of vz obtained by integrating over all vx and vy is just (40.7). But this one function (40.9) can do both those things! So, all in all, we might say that we have some difficulty. We might try some force law other than a spring, but it turns out that anything else will only make γ higher. If we include more forms of energy, γ approaches unity more closely, contradicting the facts. All the classical theoretical things that one can think of will only make it worse. The fact is that there are electrons in each atom, and we know from their spectra that there are internal motions; each of the electrons should have at least 12kT of kinetic energy, and something for the potential energy, so when these are added in, γ gets still smaller. It is ridiculous. It is wrong. "It is like the atmosphere in equilibrium under gravity, where the gas at the bottom is denser than that at the top because of the work mghneeded to lift the gas molecules to the height h."
AGW proponents should be termed 'gravity deniers'. That would be similar in stupidity to evolution deniers, flat earthers and holocaust deniers. I don't think any of us should use the word "denier" as it is an ugly and nasty thing to call some one on any subject. For obvious historical reasons. However, I do appreciate the humor in the warmists and the luke-warmists claiming that real skeptics are "deniers" when so many great ones were also of like mind with us. Dr. Brown over at WUWT called us all deniers a week ago or so and we had a long reaction. I only wanted to talk about his use of the word but he wanted to go elsewhere to hide from this use of it. At some point he told me that no physicist or other scientist trained in climate related fields would dispute the radiative warming effects of CO2. None. Nada. Zip. I mentioned this site as well as Okulaer (Kristian) as well as Joseph Postma. But he never took back the ---no one trained in related climate fields --- would dispute the radiative theory. Heck, that is just disputing the obvious facts. It does not matter if you agree with Stephen Wilde or Joseph Postma or so many others --- or not; you have to admit some trained men and women dispute the radiative theory of warming. No? By the way, thanks for the post as I had missed this opinion of Feynman. I've found Dr Brown pretty weak on certain aspects of general science outside his speciality. Sometimes it is better to be a generalist when dealing with a multidisciplinary field such as climate and weather. There is also a woeful ignorance of basic meteorology amongst many alarmists and lukewarmers. They do not realise that meteorology is a highly specialised discipline which describes how basic physics actually plays out within a real atmosphere. Often, real world phenomena turn out to be very different from what one would expect from first principles. That is what first got me interested some 60 years ago. Very few have ever studied meteorology to any extent other than weather forecasters and pilots so the field of expertise is very sparsely occupied. Note firstly that they previously referred to internal energy as kinetic energy only whereas potential energy should really be included. No doubt that was done for simplicity. Note secondly that they refer to the walls of a flexible container and it is the walls of the container that are pushed out and NOT outside molecules being pushed away. There is no need to push outside molecules away because the lowered pressure outside the parcel has removed all resistance to expansion. If there is no flexible container then the walls are effectively the outermost layer of molecules of the parcel and they cross a distance in response to the higher internal pressure of the parcel, not meeting any resistance along the way. Work is done moving the molecules across the distance so it is that distance, that additional volume , which is the surroundings and NOT molecules outside the parcel. In the process of crossing that distance work has to be done against the gravitational field which is constantly seeking to pull the parcel back down and compress it once more. It really is obvious that the relevant work is being done against gravity but people such as Kristian, wayne and even providers of some source materials have misunderstood the position and simply assumed, incorrectly, that work against external molecules was required. I agree with with the idea that if the parcel expands because no opposing force is present then no work is done and it's temperature will not decrease. Look up any fundamental physical chemistry book for this. If a molecule (assuming ideal behavior) travels into a space with no other molecule present it will not lose any energy. You can compare it to a spacecraft traveling at a certain speed in space where no surrounding molecules or gravity can oppose the movement. How much energy is then needed to travel a certain distance at a constant speed? None, because no opposing force exist so no energy is lost/converted. This is the reason why we can send space probes as far as to Pluto and further with very little fuel on board. The question is then why you and MS spent so much time in various posts trying to explain why the expansion of the parcel matters so much? Now you seem to claim it doesn't matter? In a gravitational field of course kinetic energy (KE) is converted to potential energy (PE), as Feynman describes it, when moving in opposite direction to the field. But exactly the same amount of energy is converted back to KE when the object falls the same distance back in the direction of the field. This is what the -F*dx in Feynman's description means so no net formation of energy is possible. This is the essence of conservative forces such as gravity. Somehow you missed highlighting one important sentence in Feynman's lecture (section 40-2, line 30): "Thermal equilibrium cannot exist if the external forces on the atoms are not conservative." So your reasoning that at thermal equilibrium in an atmosphere the 33 K extra heat comes from gravitational work must be wrong, according to Feynman's description. Some might argue that the additional work comes from expansion/contraction work. This could actually be the case if expansion and contraction are done in different ways (i.e. Non-conservative). But if it is only driven by the conservative force of gravity, this type of energy conversion would also have to be conservative in a homogeneous atmosphere, or you would break the 1st law of thermodynamics. Somehow you and others also argue that convection is driving the process but you never explain what drives the convection, although for most people it is obvious that it is energy from the sun. By experience, most people also know that directional convection of ensembles (parcels) of molecules (winds, currents etc) can not be sustained without energy input. Otherwise you would only have to stir your coffee cup once to maintain the convection infinitely. Random collisions between atoms/molecules will eventually convert directional convection into non-directional, unless energy is continuously fed to the system. This is the second law of thermodynamics, i.e.entropy (disorder) always increase. The disordered motion of atoms is heat of course, so convection in the atmosphere is indeed converted to heat eventually, but since this energy came from the sun from the beginning it is already accounted for so no additional heat is formed and you can't explain the greenhouse effect (GHE) by any process that depends on it. From what I read in some other posts on this blog the disbelief in Arrhenius radiative theory for the Greenhouse effect seems to come from thermodynamic arguments. The thing is that it is not a thermodynamic effect, it is a kinetic effect i.e. depends on the rate of processes and not the energetics, so thermodynamics can not be used to understand it. 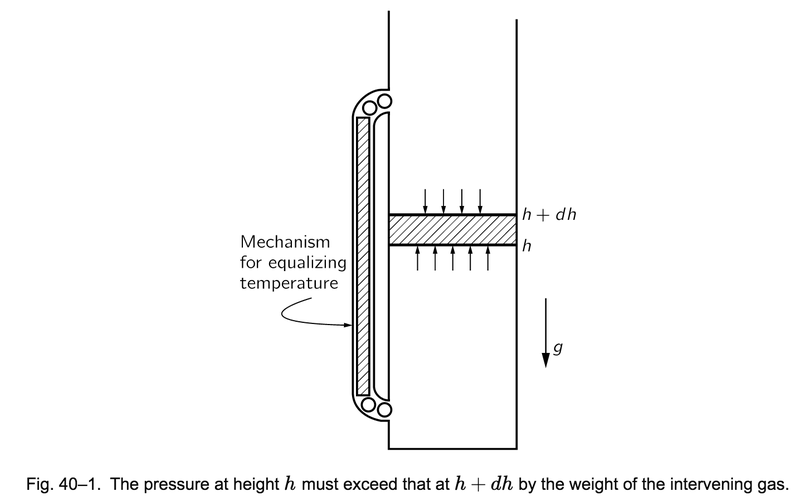 I can imagine this is more difficult for physicists to understand since they tend to work mostly with thermodynamics. However, Arrhenius was foremost a chemist and indeed he is most renowned for his work with chemical kinetics, the rate of chemical reactions, which is why the Arrhenius equation is named after him. I could explain his theory further if you would let me write my own guest-post, but I am guessing this would go against the purpose of this blog. Density differentials at the surface drive convection and that arises from uneven surface heating which is inevitable around a sphere illuminated by a point source of light. Energy taken up in ascent is matched by energy taken down in descent as you say but what you have missed is that the energy returned towards the surface cannot radiate to space because it is immediately taken up again in the next ascent. Convection is indeed a zero sum process but the energy content is denied the ability to radiate away by continuing conduction and convection. The supply of energy does indeed come from the sun but continuing insolation ensures that any energy lost from convective overturning is immediately replaced. Atmospheric mass has weight at every height and weight is a downward force created by the interaction between mass and a gravitational field. The energy at the surface beneath the atmosphere exerts an upward pressure gradient force which opposes the downward force of atmospheric mass. That energy is in the form of kinetic energy which is measurable as heat and is no more and no less than the motion of the gas molecules colliding with the surface and each other to create pressure. The higher the surface temperature the more of such motion there is at the surface and the higher up that motion and the pressure it generates can be transmitted by conduction and convection up through the mass of the atmosphere and away from the surface against gravity. 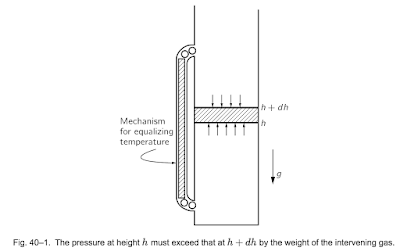 The two forces balance at the height of hydrostatic equilibrium. Below that point the upward force is the stronger of the two. Above that point the downward force is the stronger of the two. The kinetic energy locked into the job of maintaining hydrostatic balance is then unable to radiate to space past the mass of the atmosphere otherwise the atmosphere would fall to the ground. Instead, it is simply recycled up and down in constant convective overturning and is held by the atmosphere as potential energy which is not heat and does not radiate. That is the mass induced greenhouse effect. are you saying that the role of the atmosphere in all this is to keep heat away from the surface? And that the excess 33 K is the heat that keeps the atmosphere from collapsing down all the way to the surface? I think you expressed this more explicitly in your post on July 11 on this blog where you wrote: "It is Earth’s surface temperature enhancement of 33K above the temperature predicted by radiative physics that provides the kinetic energy required at the surface to maintain the upward pressure gradient force." Do you mean that at 255 K (-18C, i.e. 33 K below earths average surface temperature 288 K) the atmosphere would have completely condensed to earths surface, not having enough KE to escape the gravitational field? This can't be right since we know oxygen and nitrogen condense only at 90 and 77 K respectively. And we don't see condensation of these gases on a really cold winter's day or at the poles, right? To illustrate what I think is wrong in your reasoning it will help to go through a stepwise setting up of earths atmosphere. Pretend we have cold earth with no heat from the sun (and negligible heat from inside). Also, initially, assume the gasses of the atmosphere is trapped at the surface. When you turn on the heating source (the sun) the surface will warm to about 255K (depending on the distance from the sun) before radiative balance is reached by black (grey) body irradiation from earth (still assuming all gases are trapped at the surface). This hypothetical state is equivalent to what is expected for a planet without volatile gases. Now let's only release the non-greenhouse gases, mainly Nitrogen and oxygen. Since they are already heated to 255K they will rapidly evaporate rising up against the force of gravity and they hence perform work, converting heat into potential energy (PE and KE respectively). This will lower the temperature of the "adiabatic air-parcels", more for those who travel high and less for those who stay close to the surface. The distribution is determined by probabilities through statistical thermodynamic principles as described by Feynman above. Air immediately at the surface will have the same temperature as the surface itself (255K) since no lifting work is done and no expansion work either since the gases expand into vacuum. Note that no temperature change occurs at the surface and it continues to receive and emit the same amount of radiative energy, and there is no extra 33K in the atmosphere. It doesn't matter if the change is done gradually, all energy that drives the atmosphere to higher altitude comes from the sun and hence that amount is not used to heat the surface any further than the limit set by the radiative equilibrium. So what about convection? I don't think we need to dwell on that much further because we have already agreed that "Convection is indeed a zero sum process", as you put it. You further agree that gravity is a conservative force and write that "Energy taken up in ascent is matched by energy taken down in descent", so no net energy input can come from circulation of the atmosphere. I think my argumentation shows that there is no additional heat trapped in the atmosphere. There is heat there but it derives from the surface, and in extension the sun, so cannot add more energy to the system. The extent/height of the atmosphere is simply determined by the temperature of the surface, and that temperature is in turn set by the radiative equilibrium. There is no thermodynamic heat source except for the sun so the only way to change the temperature is to disturb the radiative equilibrium. How greenhouse gases can do this I will try to explain briefly in another comment. All that the gravito-thermal "GHE" does is redistribute the heat energy from the Sun as a 68K temperature gradient from the 220K tropopause to 288K surface due to gravity/mass/pressure/density. There is no added or "trapped" heat by either GHGs or gravity. Gravity drives the interconversion of kinetic heat energy to gravitational potential energy, back & forth, but energy is conserved as Feynman explains above. "Do you mean that at 255 K (-18C, i.e. 33 K below earths average surface temperature 288 K) the atmosphere would have completely condensed to earths surface, not having enough KE to escape the gravitational field? This can't be right since we know oxygen and nitrogen condense only at 90 and 77 K respectively. And we don't see condensation of these gases on a really cold winter's day or at the poles, right? " Why would I mean that ? With no atmosphere the surface is at 255K. The more gases rise up off that surface at that temperature the higher the surface temperature will rise above 255K. There will be gases at 255K (unavoidably) given the condensation temperatures of oxygen and nitrogen. Ah, I see that I should have said that the surface temperature of 288K provides the upward pressure gradient force and not just the 33K enhancement. Insolation sets the starting point of 255K at which point the surface is already warmer than is necessary to produce the necessary gases. The additional 33K is then related to the amount of mass within the gases because that mass requires surface kinetic energy over and above the raw radiative S-B figure of 255K to fuel convective overturning.